So you've heard that practicing yoga is good for you, you've heard there are benefits of doing yoga, but maybe you're not quite sure what the benefits of yoga reallyyyy are. The practice of yoga has been around for thousands of years. But, the modern practice of yoga is more focused on the asanas (or yoga poses) and sequencing rather than the following the entire eight limbs of yoga. It's not necessarily a bad thing, but sometimes all the other benefits get lost on us when we only practice the sequencing of yoga poses. Meditation and breath work are two other limbs of yoga and are extremely beneficial as well. But, in regards to yoga poses and yoga sequences, there are many benefits you can experience. When Can You Feel the Benefits? Is Yoga Really That Beneficial? Yoga isn't some magic pill that you take and all of a sudden your worries disappear. It's a softer medicine that you take to keep yourself well so you don't get sick, feel stiff, get sluggish or whatever. Just like it's not a fast medicine, you can't expect to do one session of yoga and all your worries are gone. It takes a daily or weekly practice of yoga to start to feel the benefits. Does that mean you should just say, “Meh, I'm not going to do it then…”? No. I would definitely say to give yoga a chance. Add it to your daily or weekly routine and you'll start to notice the shift over time. I would say give it two or three months and re-evaluate how you feel about everything. So, does that mean you need to practice for an hour every day? Nope! You can practice for 10 minutes a day and still experience the benefits of yoga. Most of my daily practices are anywhere from 10-20 minutes in the morning. It doesn't take loads of time to experience any of these benefits. Would it be good to do more? Sure. But, that doesn't mean you have to practice for longer times. I don't have a lot of time in the morning, and I'm not the type of person that's going to get up two hours before I need to have my kids ready for school. 5 am comes entirely too early, and I don't feel like getting up that early. So, I wake up at 6 am to get my 20 minutes in before I have to walk the dog, make lunches and wake everyone up. It's my peace and quiet for the day. The list below isn't an extensive list of benefits, but it's a list of benefits that are things most people really enjoy. They're the things that people most identify with when it comes to practicing yoga. A daily practice of yoga can help to relieve stress in our lives because it helps us to focus on our breathing and calming our minds. When we focus on our breath and poses that allow us to relax it naturally lowers our stress levels and stress hormones. The more you practice yoga the stronger you'll become. It's a natural progression. There are poses that require a certain amount of strength for you to perform them. It's just not “strength” in the way we typically think of strength. For instance, if you've ever held Downward Facing Dog for any amount of time you'll know that you need arm and shoulder strength for it to be comfortable. By practicing at least 3 times a week you'll be increasing your strength. This one seems kind of obvious, but there are some unflexible folks out there that think yoga is off limits to them. 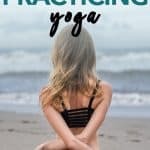 If you're one of those folks that aren't really flexible (or you think you're not flexible) I encourage you to check out this guide right here. I bought it about two months ago to look at it and I use it in my practice to help me. If you're focusing on increasing your flexibility then I would suggest holding your poses for longer. It will help your muscles to relax and elongate more. Starting a yoga practice helps to relieve stress and lower your cortisol levels. Your cortisol levels are what increases weight gain and retention. So, when you lower those levels you'll naturally start to lose some weight and be able to control your weight better. Practicing yoga also makes you more aware of your body and you'll start making different food choices and decisions that will support your practice rather than hinder it. You'll notice some foods make you feel better and others make you feel worse. The twisting and crunching you do when you practice certain yoga poses are what helps to “wring” out your intestines. This wringing is what helps your digestion. When you're twisting and crunching it encourages the intestines to move things along and increases the circulation in that area for better flow and digestion. Nowadays, people are more prone to sitting for copious hours of the day and we can start to lack the proper circulation for living a healthy life. When we practice yoga daily we are improving our circulation by getting our blood pumping and creating movement in our system. This kind of falls in line with the whole stress relief part in a sense. When you're practicing yoga and doing poses that are calming or restful it helps to calm your mind to allow for a more restful sleep. If you're feeling restless I would suggest doing a more relaxed and longer hold style of yoga to help you sleep better. Check out this post on Bedtime Yoga to help you sleep better tonight. No one really thinks about this one when they're starting a yoga practice. They just think, “Oh, I'm doing yoga to feel better.” Or, something to that effect. They don't think about it in the sense that you start to understand what foods do to your body. You'll start to notice when you're bloated, what foods make your stomach upset, what foods make you feel great, and so on and so forth. It's really interesting. You'll start to notice it more and more and begin to make better food choices that allow your body to feel it's best. There are a lot of poses in yoga that require some degree of balance. So, practicing daily helps improve your coordination and balance. If this is something you need to work on then I would try adding Tree Pose or Warrior III into your practice each day. Both of those poses require a good bit of coordination and balance… and patience too. You just generally feel way happier when you do yoga on a regular basis. Even if you can only do 3 practices a week it's totally better than nothing at all. Get on your mat and do some sun salutation a's or sun salutation b's and get your happy on! That would be a definite YES. Yoga is one of the best things I've ever encountered for helping me to stay sane and feel like I'm doing something good for myself. You don't necessarily have to do it every single day, but I would definitely aim to do it every day if you can. It has tons of benefits even outside of the nine I've listed here. You can do some research and find tons of information about how good it is for you. A great place I always recommend people to look at is Yoga Journal. Are You Confused about What Foods to Eat On Keto? Download your FREE printable shopping list and Keto Food Guide and never be confused or overwhelmed again! THE PAGES ON THIS SITE MAY CONTAIN AFFILIATE LINKS. YOU CAN SEE MY DISCLOSURE FOR MORE INFO!